Water balance is important as it ensures that the mineral content of the water is in an appropriate state to protect the spa surface and equipment and make spa water more comfortable to bathe in. Water balance is affected by a wide range of variables – the quality and source of the water, what chemicals are added to the water, the exposure of the spa to weather conditions and so on. Due to the small water volume, raised water temperature and rapid agitation, chemical reactions occur much more rapidly in spas than they do in a pool environment, making water balance even more critical. 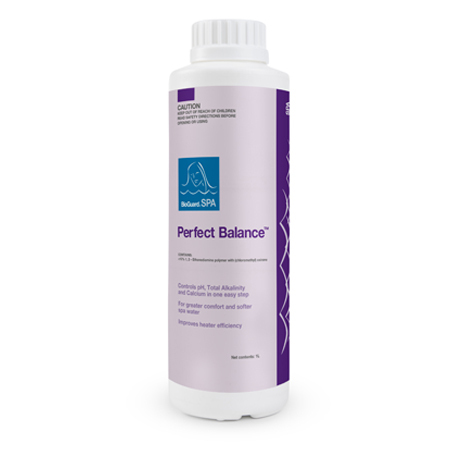 A proper balance of chemical factors such as total alkalinity, pH and calcium is needed for the sanitiser to work correctly, the water to be pleasant to bathe in and to prevent scaling or corrosion of the spa surface and equipment.